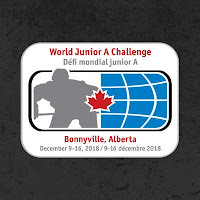 Hockey Canada announced their roster on Wednesday that will represent Canada West at the upcoming 2018 World Junior A Challenge that runs December 9th-16th in Bonnyville, Albeta. 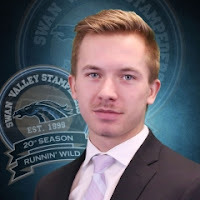 Among those selected was Swan Valley Stampeder forward and 18 year old Matt Osadick. The Grande Pointe, MB product has had a career year this season, compiling 18 goals, 24 assists for 42 points in 27 games, which puts him behind his linemate Josh Tripp in 2nd spot in the MJHL scoring race. Osadick was one of 3 MJHLers named to the Canada West roster which also includes F Reilly Funk (Portage Terriers) and G Matt Radomsky (Steinbach Pistons). Canada West will open up their tournament on Sunday at 7PM against the USA before taking on Canada East on Monday, Russia on Wednesday and the Czech Republic to wrap up their round robin schedule on Thursday. The Playoffs will go on the weekend. 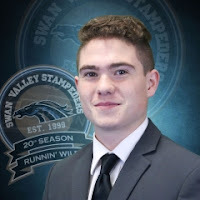 The Swan Valley Stampeders' returned to the win column in a big way on Wednesday as they hammered the OCN Blizzard 6-2 on the road. Reigning MJHL Player of the Month Brad Goethals had a big night with 4 goals while line-mate Josh Tripp (pictured above) chipped in 1G 4A of his own to lead the way. Alex Uryga had the other goal for Swan while 20 year old Merek Pipes made 29 saves on 31 shots to pick up his 5th victory of the season. Darren Gisti and Dodge Long replied with the goals for the Blizzard. The win snapped Swan's 4 game losing streak and pulled them back within 2 points of Portage for top spot in the MJHL standings after the Terriers fell on Wednesday 5-3 on home ice to the Virden Oil Capitals. The Stamps' return will look for back to back wins when they return to action on Sunday afternoon in Dauphin against the Kings. GX94 will broadcast the game with Yorkton Dodge Junior Hockey, pregame begins at 3:50, pxp will start at 4PM. Nathan Reay made 29 saves to earn his 3rd win of the season as the Waywayseecappo Wolverines defeated the visiting Neepawa Natives 3-2 at the Wayway Arena Complex. Brandon Lawson, Bryce Krauter and Riley Vautour all scored for the Wolverines while Tom Sweeney and Noah Carson replied for Neepawa. The Wolverines' next game will be on Friday night when they visit the Dauphin Kings at 7:30 from Dauphin's Credit Union Place. Follow Benny GX94 Sports on Twitter!